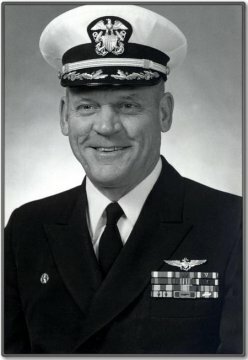 Captain Robert L. Kiem, USN Retired, died November 29 in Orange Park, Florida following a brief illness. He was born in Pensacola, Florida in June, 1939 to Ed and Harriet Kiem. Bob was active in the Boy Scouts and earned the rank of Eagle Scout. He graduated from Pensacola High School in 1957 and continued his education at the University of Florida where he earned a degree in Journalism in December, 1962. While at UF he met a FSU coed, the lovely Letty Anne Lee of Palmetto, FL. They soon married and recently celebrated their 49th anniversary. Following graduation, Bob immediately entered the Navy flight program. He was designated a Naval Aviator in August 1964, and reported to NAS Cecil Field for training in the A-4 Skyhawk. Bob joined VA-12 for his first sea duty and made deployments aboard USS Franklin D. Roosevelt (CVA-42) to the Mediterranean and Viet Nam. This was followed by a tour as LSO and flight instructor with VA-44 at NAS Cecil Field. In 1969, still flying the A-4, Bob returned to sea and served as CAG 8 LSO in USS Shangri-la for another deployment to Viet Nam. During this deployment, however, he managed to fly the supersonic F-8 Crusader and earned his 1000 mph pin. He returned to Cecil Field to transition to the more powerful A-7 Corsair II. Having completed his tour with CAG-8, Bob reported to Naval Postgraduate School, Monterey, CA, where he earned his MS in Personnel Management. He then moved on to Washington, DC and the Office of the Chief of Naval Operations, Manpower Planning and Programming. In 1975 LCDR Kiem reported to VA-82 and completed two Mediterranean deployments in USS Nimitz (CVN-68) flying the A-7 Corsair II. He then reported to Commander Light Attack Wing-One (CLAW-1) at NAS Cecil Field, FL as the Maintenance Officer. Commander Kiem commenced the first of five command tours in 1978 with Command of VT-25, NAS Chase Field, Beeville, TX flying the TA-4 Skyhawk. This tour was followed by command of VA-72 at NAS Cecil Field and completing a deployment in USS America (CV-66). During this deployment, in March 1983, he achieved his 1000th carrier landing. Following this deployment, Captain Kiem assumed command of VA-174, the A-7 Fleet Replacement Squadron, NAS Cecil Field. Believing his flying days were over, Bob assumed command of USS Guam (LPH-9) homeported at NS Norfolk, VA with a deployment to the Mediterranean Sea. He then took command of USS Peleliu (LHA-5), homeported in Long Beach, CA. After completing his last assignment at sea, he was transferred to awaii for a tour as the director for CINCPAC Cruise Missile Support Activity, responsible for mission planning for cruise missiles in the Pacific Fleet, including those used during the initial attack on Baghdad in Operation Desert Storm in 1991. For his final assignment Captain Kiem served as Chief of Staff for Commander, Naval Air Training Command in Corpus Christi, TX where he had the opportunity to get back into the cockpit of the TA-4 and the Navy's newest training jet, the T-45 Goshawk. After completing 4400 hours flying and 1044 carrier arrested landings, Captain Kiem retired from the Navy in May 1993. Following military retirement Bob and Annie moved into their Orange Park home for the fourth time. He continued playing golf as often as possible and served as President of the Cecil Field Golf Association. Bob was a dedicated blood donor for many years. He also served as a Poll Worker and Clerk of a Precinct in Clay County. Bob will be remembered for his unconditional love of his family, his unwavering support for his country, and his pride in his military service. Warm and outgoing, with a quick smile and a ready wit, he never met a stranger. Bob Kiem is survived by his wife, Annie, three children: Doug (Bear) Kiem (Angie) of Poway, CA, Beth Schemenauer (Keith) of Fort Pierce, FL, and Katie Seslar (Dennis) of Riverview, FL., his siblings Betty Herndon (Dave) of Greenville, SC, Linda Nolte (Pat) of Springfield, Va., Michael Kiem (Jane) of Orlando, Fla., and Debbie Hodges (Ken) of Tallahassee, Fla. He was most proud of his six grandchildren, and relished his role as Grandpa. A memorial service with full military honors was held on Monday, December 5, at Jacksonville Memory Gardens Funeral Home, 111 Blanding Blvd., Orange Park. Tributes may be posted in celebration of his "Damn Near Perfect" life in guestbook@Jacksonville.com.